Despite all of the gaps where no Amtrak service exists, there are many interesting weekend getaways that are readily available to travelers on Amtrak trains. Below are several suggestions that each offer a chance to combine a train journey with a pleasant destination. Most of the destinations listed below require only a long weekend to fully appreciate while for others, travel times to these locations may extend the trip by several days. 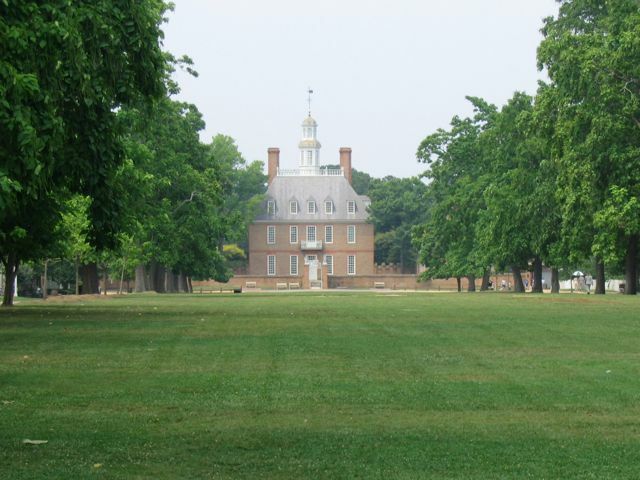 Williamsburg, Virginia: This historic city is a delight as visitors experience Colonial Williamsburg much like the nation's founding fathers did. 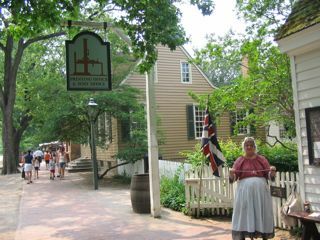 The historic district is off limits to vehicular traffic and employees of the colonial area are attired in traditional clothing of the late 1700s. Horse drawn carriages ply Duke of Gloucester Street and sheep and other livestock graze in the multiple green spaces that dot the community. One can almost see Thomas Jefferson, Patrick Henry, and other colonial icons while strolling or riding a bicycle along the tree lined cobblestone streets or dining in a colonial tavern facing Duke of Gloucester Street. 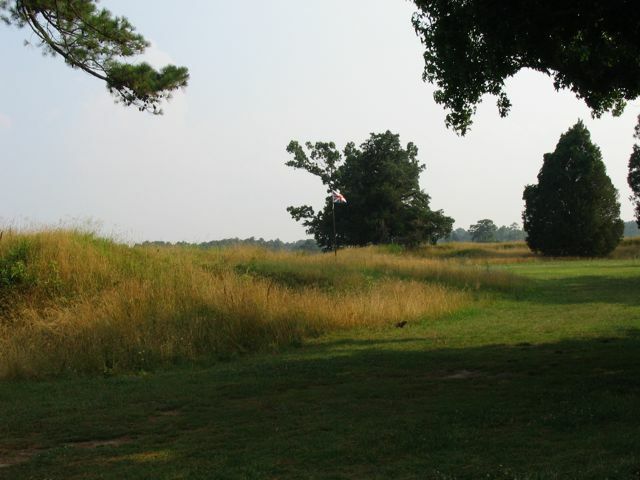 Other historic sights that are within a 20 minute drive via rental car include Jamestown, America's oldest colony, and Yorktown where the Yorktown Victory Center and adjacent Revolutionary War battlefield tell the story of the Colonies' struggle for Independence. Other enjoyable activities that can be reached by rental car are the James River ferry, a relaxing trip across the James, and visits to many of the historic plantation homes along the James River including Berkeley and Shirley Plantations near Charles City and Carters Grove Plantation outside Williamsburg. 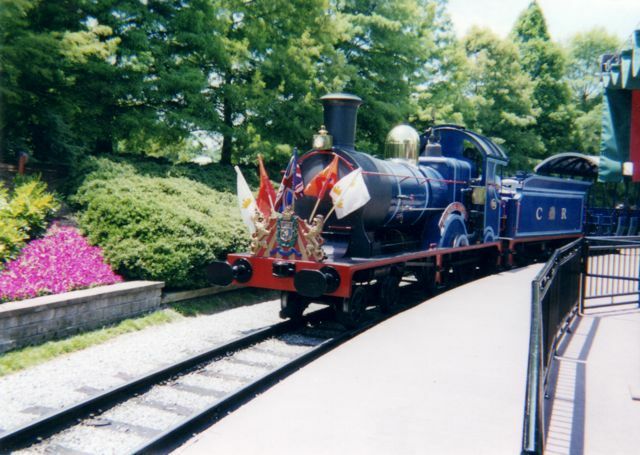 Present day fun awaits right outside Williamsburg at Busch Gardens which replicates European lands and offers everything from roller coasters to old world entertainment to a miniature train ride. Reaching Williamsburg by rail is easy as Amtrak offers two trains per day (three on Fridays) from Boston, New York, Washington and other points in the northeast. 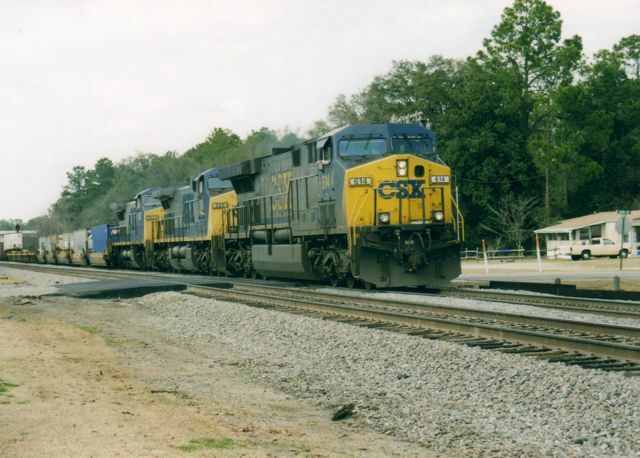 Coming from points south is not quite as easy as a connection in Richmond is required and a long layover can be expected except from the train serving Charlotte and Raleigh. A better option would be to rent a car in Richmond and make the short drive to Williamsburg. 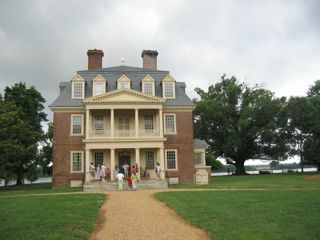 The Williamsburg station is an attractive colonial depot built by the Chesapeake & Ohio Railway. C&O trains including the George Washington stopped in Williamsburg on their way from Newport News to Cincinnati and Chicago and offered coaches, sleepers, and dining cars. Service to Chicago continued for many years under Amtrak, usually with only one or two coaches that were coupled up to a section from Washington that included coaches, a sleeper and a diner. That routing disappeared many years ago as Amtrak incorporated the line to Newport News into its routes serving the Northeast Corridor. 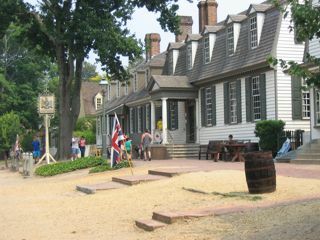 Ample lodging is available in Williamsburg with most hotels within a couple miles of the station. 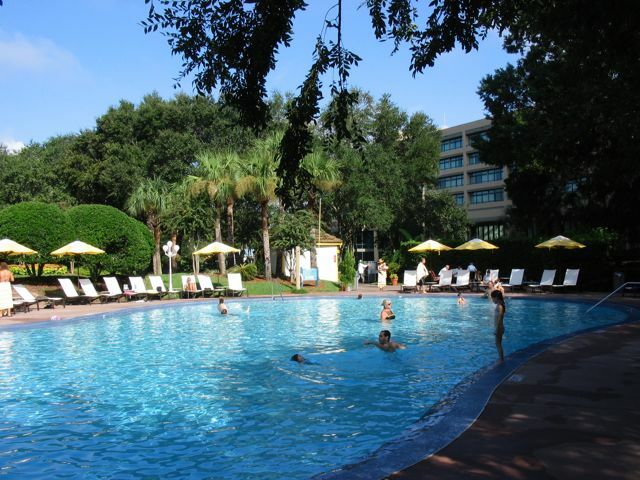 The most convenient is the Williamsburg Hospitality House which is within easy walking distance while another personal favorite is the Hilton Garden Inn, two miles west and within view of the CSX rail line. In addition to Amtrak, the CSX line is busy with multiple coal trains each day. 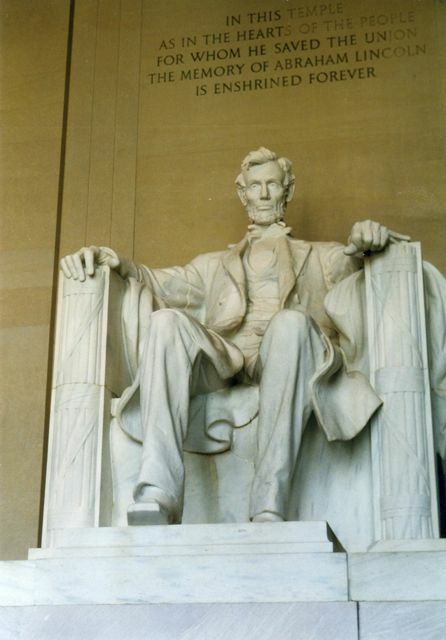 Washington, D.C.: The nation's capital offers a collection of sights to satisfy any visitor. Famous government buildings such as the US Capitol, the White House, and the FBI Building are among the city's top draws. Washington is awash in memorials with the Washington Monument, the Lincoln Memorial, Jefferson Memorial, World War II Memorial, the U.S. Marines Memorial, and the Vietnam Memorial each luring crowds every day. If you like museums, this is certainly your city as the Air and Space Museum, the National Gallery of Art, the Museum of Natural History, and the Smithsonian Institution are all world class. 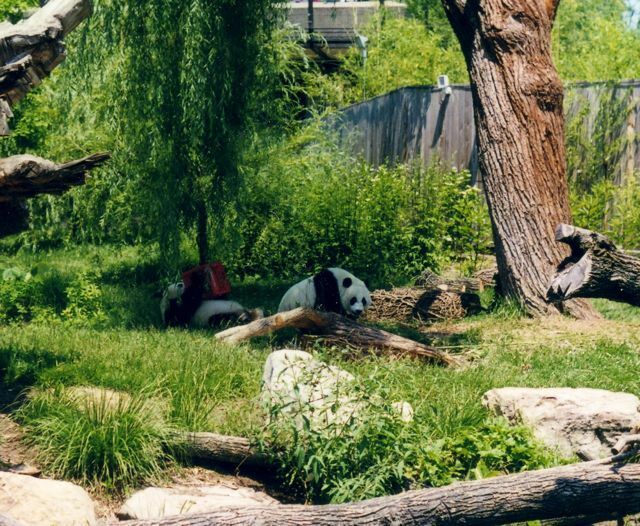 The National Zoo is located on the north side of the District and Arlington Cemetery is located across the Potomac River from Washington. Most of these sights are within walking distance of one another and most can easily be reached by the city's efficient Metro subway system. 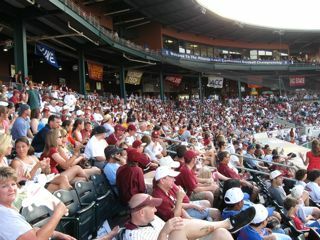 Most of these sights are free of charge though some require a reservation due to popularity and security concerns. 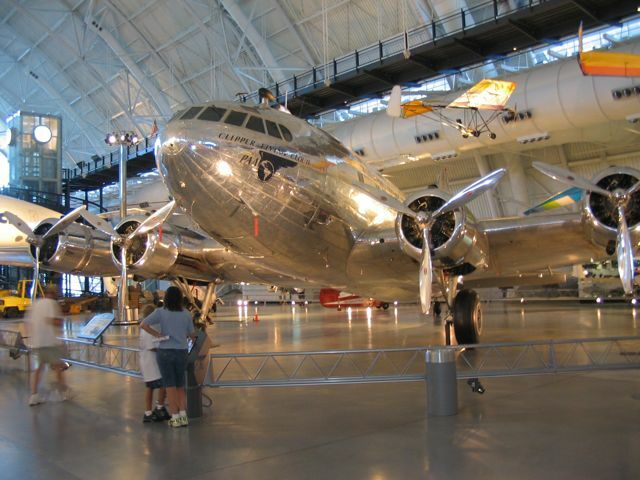 Another must-see that is not accessible by subway is the Air and Space Museum Annex which is located at Dulles Airport many miles west of the city in suburban Virginia. This facility houses an impressive array of aircraft including the Enola Gay bomber, a Concorde supersonic jet, and the prototype space shuttle Enterprise. George Washington's home, Mount Vernon, is another area highlight which can be accessed by automobile 30 minutes south of Alexandria. The Air and Space Annex at Dulles Airport west of Washington, D.C.
Railfans are in luck in Washington as there are a variety of rail related activities. Many of the Metro subway system's routes are actually above ground and the Yellow Line crossing of the Potomac River is particularly scenic. Amtrak's high speed Acela trains can be seen from the Metro Red Line in the vicinity of the New Carrollton station which is shared with Amtrak. 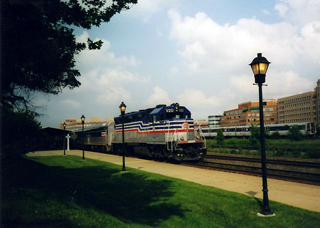 There are three good commuter rail round trips available from Washington: the MARC Camden Line to Baltimore via the old Baltimore & Ohio route, the Virginia Railway Express line to Manassas via the Norfolk Southern route used by Amtrak's Crescent, and the VRE Fredericksburg line which travels along the CSX route traversed by Amtrak's Florida trains as well as trains to Charlotte, Newport News, and Richmond. A fourth commuter route, MARC's Brunswick route requires an overnight at the end of the line. Washington Union Station is a tourist destination in itself as it houses many fine stores and restaurants, many fast food places and delis, and a multi-screen movie theater. This gateway to the Capitol is truly one of America's greatest train stations and is an architectural masterpiece. There are so many hotels in the Washington, D.C. area that a visitor can hardly go wrong. My favorite is the Embassy Suites Old Town in Alexandria, VA as it is a wonderful hotel and is right across the street from a Metro station and a short walk from the Amtrak Alexandria station. Guests accommodated in suites facing the railroad can watch an endless parade of Amtrak and VRE passenger trains, CSX and NS freights, and Metro subway trains which are above ground at this point. 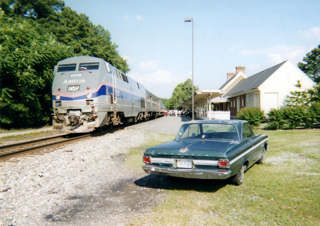 The Alexandria Amtrak/VRE station is a great place to watch trains and on many evenings local railfans can be found sitting in lawn chairs beside the station. My other favorite area hotel is the Marriott in Falls Church, VA which is located in a quiet wooded office park. There are no rail lines close to this hotel, however, courtesy shuttle service is provided to a Metro station from which all popular sights can be reached. On the north side, the Courtyard by Marriott in Landover/New Carrollton is within view of the Northeast Corridor rail line and is connected by hotel shuttle van. Washington is linked to the rest of the country via multiple routes. 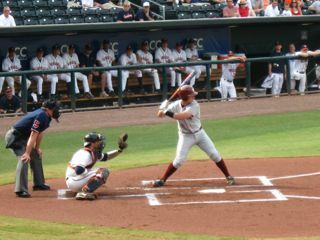 The Northeast Corridor boasts frequent service to New York and Boston while two daily trains run south to Florida and several more serve Richmond. 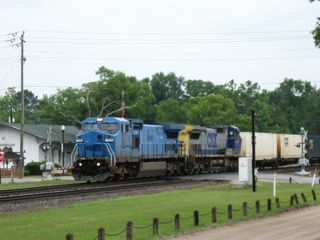 Charlotte, Raleigh, and Savannah are connected to Washington by day trains while overnight service from Chicago connects this destination to points west. Another overnight route operates to Atlanta and New Orleans. A novel way of reaching Washington is Amtrak's Auto-Train from Florida which carries passengers along with their automobiles. Ashland, Virginia: This charming town would best suit two groups of visitors: railfans and those looking to relax. 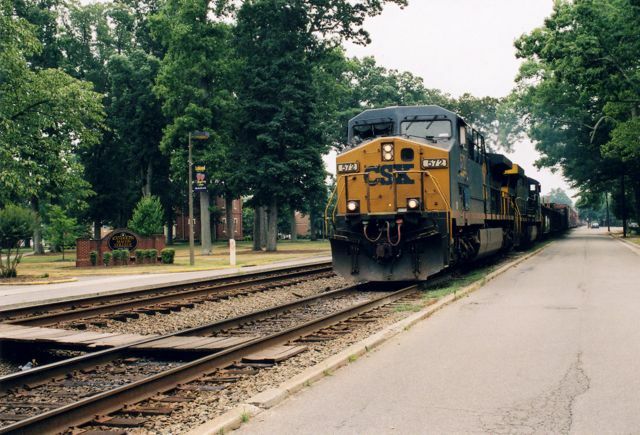 Ashland is featured in many Amtrak ads as its scenic downtown and bucolic Randolph-Macon College form a pretty scene as trains glide along the double track former RF&P Railroad which travels in the median of Center Street through town. Ashland has become a railfan mecca as 10 long distance Amtrak trains pass through each day along with several others that link Richmond and, in some cases, Newport News, with the Northeast. 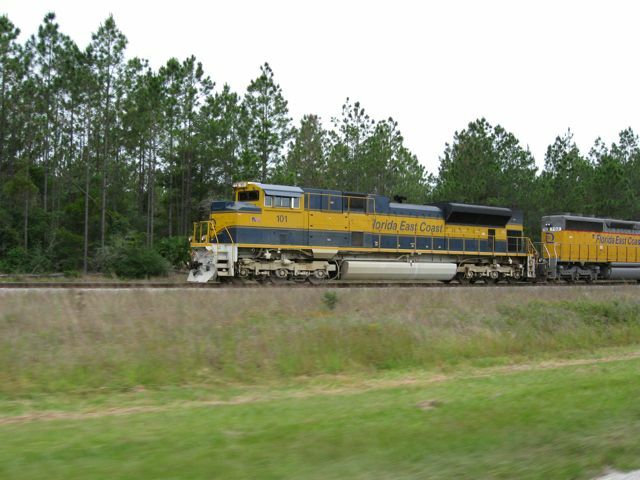 Add in multiple CSX freight trains and this is one great place to watch trains. The Amtrak station houses the local chamber of commerce and is a fine base for railfanning. Between trains it is easy to browse in downtown shops including Train Town Toy & Hobby Shop or stroll around the college without missing the action. Trains indeed are the major attraction here and one should not plan a visit if major tourist sights are desired. 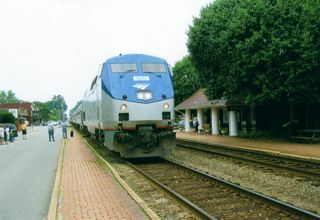 Amtrak Regional trains connecting Boston, New York, and Washington to Richmond and Newport News stop in Ashland. Unfortunately all long distance trains pass without stopping which is a great sight to behold but less simple to travel to this town. The Henry Clay Inn is a favorite of railfans as it is located across the street from the depot. Other chain motels are a couple miles east of town beside I-95. Jacksonville, FL: Twice daily Amtrak trains from New York stop in Jacksonville with an equal number of northbound trains arriving from Miami. This is a far cry from the pre-Amtrak days when the Atlantic Coast Line and Seaboard Air Line carded 8 daily trains in each direction. 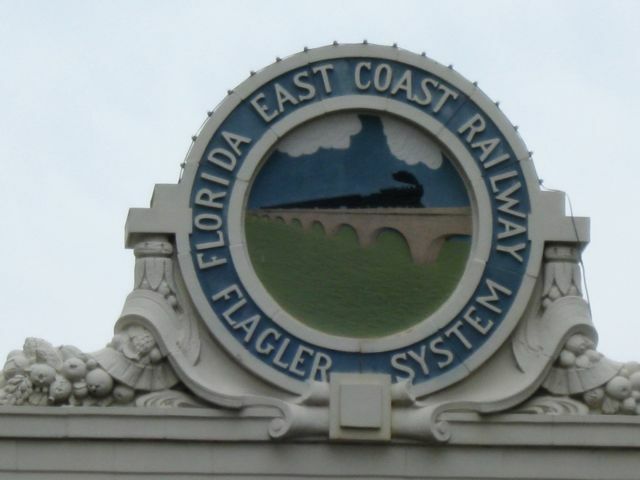 Back then Florida's Gateway City also was served by streamliners to Chicago, St. Louis, New Orleans, and Atlanta. Until the 1960s the Florida East Coast and Southern Railway also hosted streamlined trains into Jacksonville. 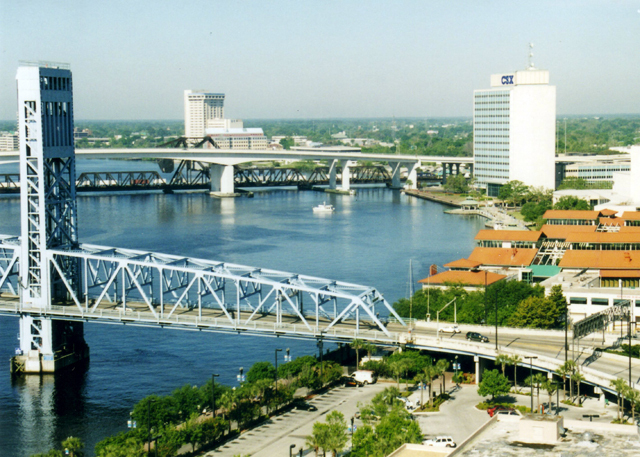 Despite today's reduced service, Jacksonville is a great place to spend a weekend as it is a perfect jumping off spot for many nearby activities.. 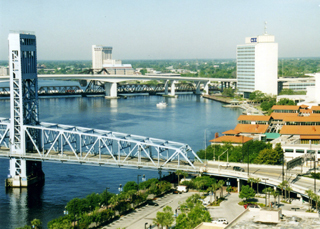 Downtown Jacksonville is located on the St. Johns River and the city skyline makes a nice picture especially at sunset. The Jacksonville Landing is a nice shopping and dining area overlooking the river. 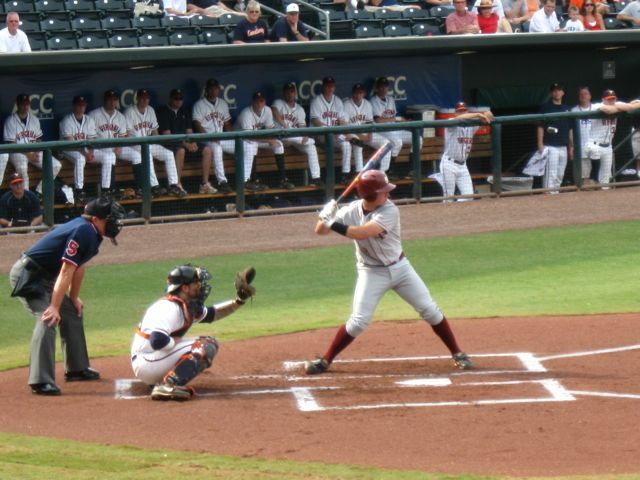 Nearby the sound of wood bats striking baseballs fills the summer air as the Class AA Jacksonville Suns battle rivals from the Southern League at the Baseball Grounds of Jacksonville, a new stadium built to replicate an old time ballpark. 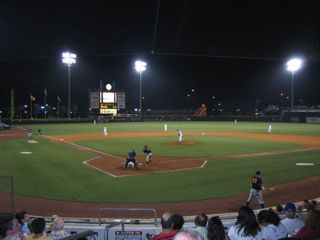 The Suns play in the Southern League against teams from cities such as Chattanooga, Montgomery, Birmingham, and others. 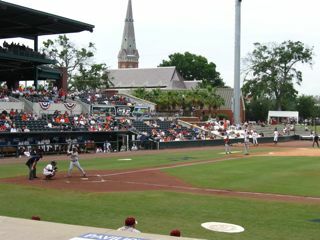 The Atlantic Coast Conference often hosts its college baseball conference tournament at this stadium. 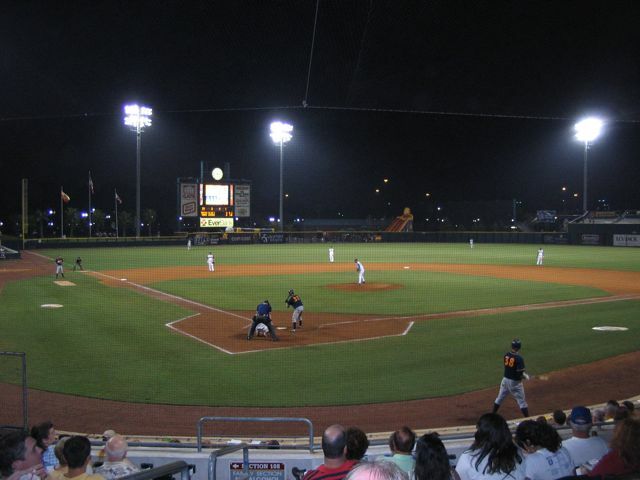 Next door the NFL Jacksonville Jaguars play their home games in Alltel Stadium. Miles and miles of sandy beaches entice visitors to the shore from nearby Fernandina Beach to Atlantic Beach, and south to St. Augustine Beach. Florida's coastal highway, route A1A, traces the coastline east of Jacksonville and even uses a throwback means of crossing the St. Johns River via a ferryboat at Mayport. 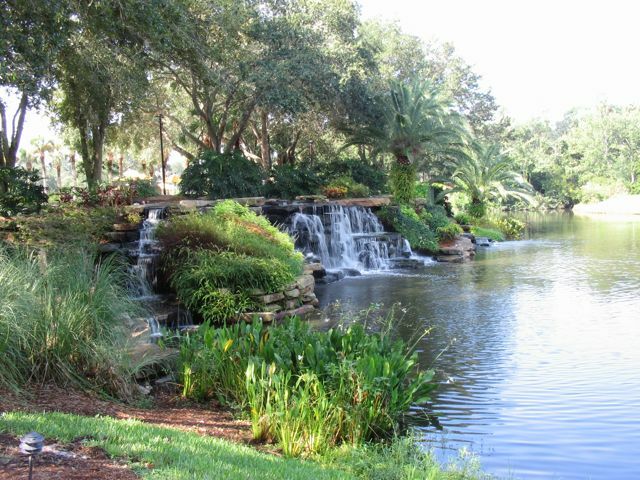 Traveling south from that point we pass through Jacksonville Beach and soon arrive at Ponte Vedra Beach where wide beaches and sparkling waters welcome an afternoon in the sun. 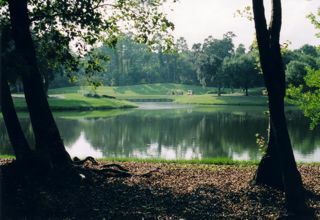 Ponte Vedra is one of our favorite destinations as long weekends are occasionally spent at the Marriott at Sawgrass Resort located just off Highway A1A. 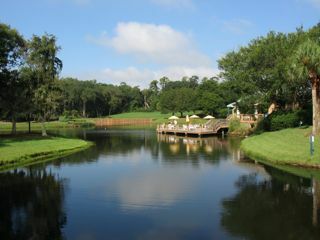 The Marriott at Sawgrass features a 4 star full service hotel and comfortable guest villas behind the main hotel building. The resort has something for everyone, a pair of oversized swimming pools where one can relax on a chaise lounge beneath stately oak trees, tennis courts, a putting green, and the adjacent TPC golf course whose island green hole is one of the signature holes on the PGA Tour. Hotel guests may use bicycles to ride around the grounds or along bike paths that travel through the area. A complimentary hotel shuttle bus drops guests at the members-only Beach Club where a nice beach, private swimming pool, and grille await. The resort also provides supervised activities for children that offer mom and dad a break. A short drive south of Ponte Vedra Beach via A1A or south of Jacksonville proper via US 1 is St. Augustine, the oldest city in the United States. Here one will find the Castillo de San Marcos, a Spanish fort dating to the late 1600s that today is a National Monument. 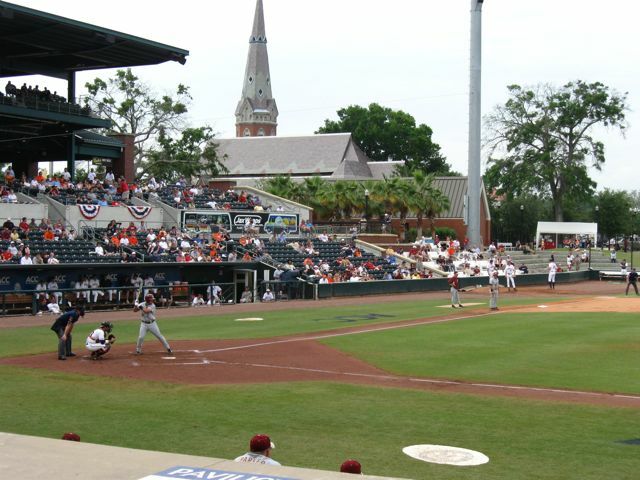 Ponce de Leon's fabled Fountain of Youth, Potter's Wax Museum, Nation's Oldest School building, and many other old-Florida attractions survive here. The downtown area today contains many side streets that host antique shops and eateries that are popular with tourists and Florida East Coast freight action can be viewed at many points along US 1. Until recently St. Augustine was the headquarters for the FEC and its former home office still bears reminders of its lineage. 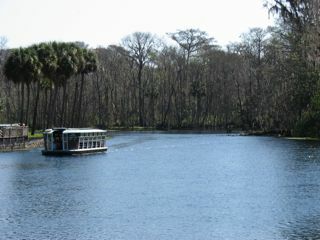 An hour or so southwest of Jacksonville visitors will find one of Florida's original attractions, Silver Springs. This attraction dates back over a century and retains much of its original allure as neatly manicured grounds line the banks of the Silver River whose crystal clear waters reveal views of bubbling springs dozens of feet below the surface. Glass bottomed boats transport visitors on a narrated tour down the river for excellent views of the springs as well as fish, wild birds, and moss draped cypress trees. Through the years scenes from many movies have been filmed at Silver Springs including the six original Tarzan movies, The Yearling, The Creature From the Black Lagoon, and Moonraker as well as over 100 episodes of the 1960s television series Sea Hunt. 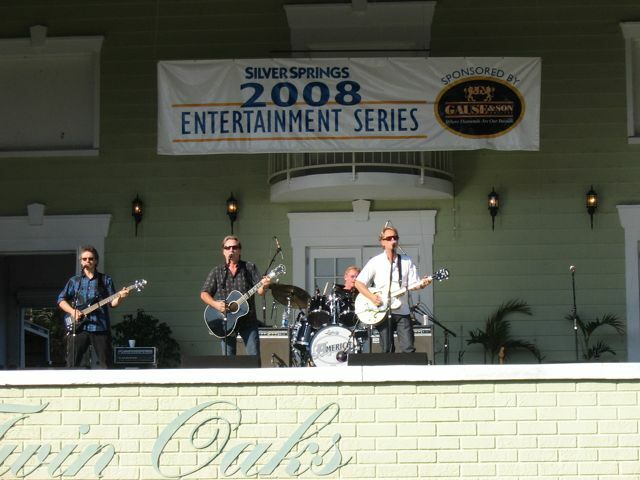 In recent years Silver Springs has hosted a popular concert series each spring. This year such well known performers as Anne Murray, the Beach Boys, America, and Tony Orlando were on the playbill. 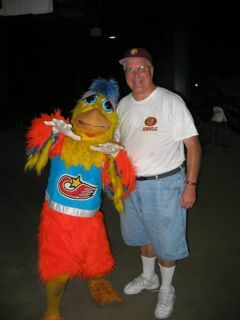 This writer and family attended one such concert starring America, one of the hottest bands of the 1970s. 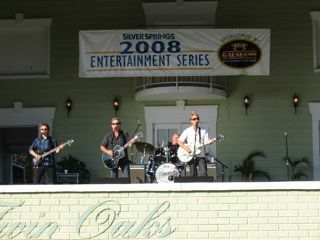 Though best known for hits such as A Horse With No Name, Tin Man, and Sister Golden Hair, America has continued to record albums and CDs as recently as 2007 when their excellent Here and Now CD was released. Through the years a number of America songs have been about trains, notably From A Moving Train and Sleeper Train among others. There are dozens more cities served by Amtrak that are well suited for weekend visits. Future installments of this article will explore more of these and surely readers will discover many others.